Governments around the world expressed shock and scorn Thursday at the Iranian president's call for Israel to be "wiped off the map," and several summoned Tehran's envoys in their capitals for a reprimand. However, Israeli calls for Iran to be expelled from the United Nations over the remarks by President Mahmoud Ahmadinejad were not immediately taken up by other nations. In a speech Wednesday, Ahmadinejad denounced Israel and said a new wave of Palestinian attacks "will wipe this stigma from the face of the Islamic world." 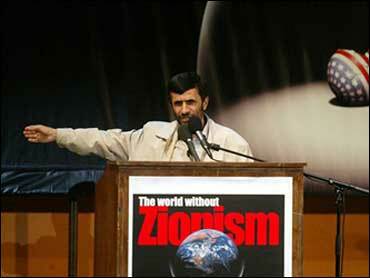 Citing the words of the founder of Iran's Islamic revolution, the late Ayatollah Ruhollah Khomeini, Ahmadinejad said: "Israel must be wiped off the map." Israeli Prime Minister Ariel Sharon on Thursday called for Iran to be expelled from the U.N., saying "a state which calls for the destruction of another people cannot be a member of the United Nations." Foreign Ministry spokesman Mark Regev said Israel had not decided whether to ask officially for Iran's removal. Israel's deputy ambassador to Britain, Zvi Rav-Ner, said it was unheard of for a U.N. member state to call "for genocide and wiping off of another member state of the U.N."
"This is a clear contravention and breach of the U.N. charter and it should be dealt with by the international community," he told British Broadcasting Corp. radio. Meanwhile, Iranians will hold massive demonstrations Friday to back their president in the face of international criticism of his remarks, Iran's foreign minister said. Manouchehr Mottaki said Thursday the demonstrations will take place in Tehran and other parts of the country to mark al-Quds Day – the annual event when Iranians protest Israel's control over Jerusalem. British Prime Minister Tony Blair said Ahmadinejad's comment was "completely and totally unacceptable" and underscored the need to prevent Iran from acquiring nuclear weapons. "I have never come across a situation of the president of a country saying they want to ... wipe out another country," Blair said. "Their attitude towards Israel, their attitude towards terrorism, their attitude on the nuclear weapons issue, it isn't acceptable. ... Can you imagine a state like that with an attitude like that having a nuclear weapon?" he said. Blair, speaking at the close of a European Union summit outside London. said the comments made him feel "revulsion." Relations between the EU and Iran have deteriorated in recent months after negotiations with Tehran failed to get Iran to drop its nuclear program, which the EU and the United States fears is being used to build weapons. Iran says its nuclear program is peaceful. The 25 European Union leaders at the summit also condemned the remarks, saying they "will cause concern about Iran's role in the region and its future intentions." "Calls for violence, and for the destruction of any state, are manifestly inconsistent with any claim to be a mature and responsible member of the international community," the EU leaders said in a statement. Australian Prime Minister John Howard called Ahmadinejad's remarks "dangerous" and said they required a U.N. response, although he wasn't specific. "To have the president of any country saying another should be wiped off the face of the earth is a reminder of the psychological pressure, quite apart from the actual pressure, that the state of Israel is under, and this obviously is an issue that the United Nations has to address," he said. Newspapers across the Middle East, meanwhile, reported Wednesday's speech by Ahmadinejad without comment, many of them on their front pages. Egyptian Foreign Ministry and Cabinet officials said Cairo would have nothing to say on the address. Jordanian Deputy Prime Minister Marwan Muasher also declined comment. European Commission President Jose Manuel Barroso said the Iranian leader's comments were "completely unacceptable," but when asked whether Iran should be expelled from the U.N., he said: "I will not make any concrete proposal now." France, Russia, Spain and The Netherlands summoned the Iranian ambassadors in their capitals to explain the remarks. French Foreign Ministry spokesman Jean-Baptiste Mattei said the ambassador "was reminded that the right of Israel to exist cannot be contested." The German and Austrian foreign ministries also called in Iranian diplomatic representatives to protest the comments, while Italy said the remarks confirmed concerns over Tehran's nuclear program. "The contents and tone of such unacceptable statements confirm worries over the political positions pursued by the new Iranian leadership, especially concerning the nuclear dossier," the Italian Foreign Ministry said in a statement. Russian Foreign Minister Sergey Lavrov, on a visit to Israel, criticized the Iranian leader. "I don't agree that anyone should challenge the right of any U.N. member to exist, this is indeed inadmissible," Lavrov said. But on Wednesday he brushed off Israel's calls for Security Council action, saying the matter is "too serious to be guided by politics." Canadian Foreign Affairs Minister Pierre Pettigrew condemned the comments in a strongly worded statement. "We are in the 21st century. Canada will never accept such hatred, intolerance and anti-Semitism. Never," the statement said.